Take control of the room — and a laptop’s cursor — with the Expert Wireless Presenter with Green Laser Pointer & Cursor Control. Sometimes pointing just isn’t enough. With a simple flick of a switch, you toggle between presentation and cursor control modes. The wireless 2.4GHz receiver stores conveniently inside the remote, and since it’s uniquely paired, you don’t have to worry about device interference. Make your point with a green laser that’s 10 times brighter than standard red lasers. 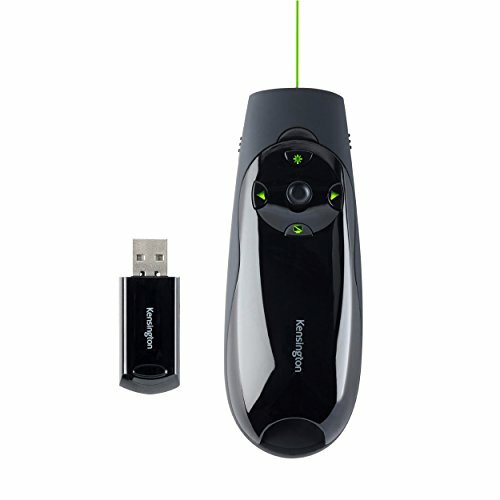 GREEN LASER POINTER - 10x brighter than a red laser, it can be seen clearly on any presentation screen, including traditional projection screens, TV displays, LED screens, and smart boards.